Note: This post is accurate as at 2008. Things have moved on and up since then so I do now attend beauty related events when invited and I am sent press samples by PR or brands now and then. These are always clearly indicated and in the main, most products featured as still purchased by me. You may read my disclaimer for posting guidelines. I’ve been getting some emails lately which troubled me a tad. So, in true blogger fashion, I’m going to have my say to get it out of my system. Untypically of my usual benign beauty writing style, do expect some ranting ahead so don’t read on if you prefer not to be subjected to rants on this site. Thank you 🙂 For the rest of you more adventurous folks, you may continue reading after the jump. Firstly, I do not profess to be an authority on anything I write about. I’m not working in the beauty industry and I’m no chemist. I’m clueless about ingredients and how they affect the skin. At the end of the day, I’m writing about skincare and beauty products which work and do not work for me, and as with anything chemically induced, different products will work for different people as our skin make up is all different. 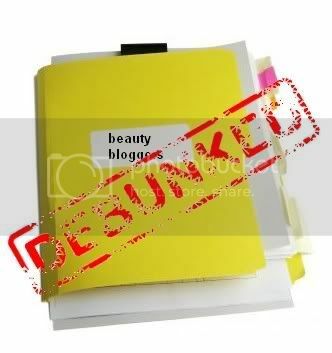 Some people who write about beauty stuff may be authorities in their field due to work or experience or qualifications. I’m not. Secondly, we all look different with different skin colouring etc. Don’t read my review, buy the product and then come after me when it doesn’t work for you in terms of colour, texture etc! My reviews are a guide, not a bible. (see note above) Thirdly, I do not get lots of stuff for free. Yes, there are some lovely people who have contacted me all the way from the UK, Australia and USA to send me samples and products for a review. This is clearly indicated in my reviews. But this is in the vast minority. From Malaysia, only 1 company has contacted me thus far at time of writing. Everything else I review comes from my own pocket or from samples I receive at counters or are gifted by friends and fellow beauty fans (and I thank them for always letting me have something new to talk about!). (see note above) Fourthly, I don’t get to attend beauty product launches and events for free contrary to what some might think. In fact, I’ve never attended any! My information on new products or upcoming releases are sourced from online and print and might be limited. Its not that I don’t want to attend launches or events, but beauty bloggers here in Malaysia haven’t reached that level of recognition that our beauty blogging sisters in the USA have. In a way, I’m glad because this allows me to give my comments in a more impartial manner. But of course, it would be fun eh? Nicely said. Hope that clears up whatever is bothering you. I, on the other hand, have no problem whatsoever with your review. In fact, I love them. some people’s got the nerve! well, paris, fame and jealousy coexist i guess. don’t bother about them and write on and rave/rant about whatever you have tried. you don’t have explain to those idiots here, actually. we love your style. for all you knows, maybe it’s someone who works for the products that didn’t work for you! That’s why I have a disclaimer. But again, some pple don’t read that. Hope whatever got you wasn’t scathing or anything. Well, I was annoyed once by someone who used to visit my blog. The thing that got me was that this person was putting down too many negative comments even in my personal blog and subsequently VW to get on my nerve. I can tolerate critique, but not once too many, and worst if it isn’t constructive! Good on ya, ParisB! Sometimes people should just bugger off, really. I’ve come to a stage where if I get comments and emails which annoy me, I hit the delete button with no qualms. Of course that goes against my stand of freedom of speech but I say you go get your freedom of speech elsewhere and stop hogging my bandwidth with useless hot air which means jack to me. I agree with Jojoba–jealousy comes with fame, my dear. Let it slide off you like cheap makeup 😉 What’s next, paparazi? Oh and btw, if you ever need an entourage, call me! And totally agreed, the main reason I read your blog is because you do give your honest opinion. I hate those that plug for brands. Go Paris! Your website is good as it comes from a consumer’s point of view. For people who think otherwise… They’re just jealous that you have such a famous site. HAHA! Bad day? me too leh. dont worry bout them nasty commentors. I have my fair share of them too….we can never please everybody…i mean different products works for different ppl ma. *applause* Well said!!! and I can’t agree more!!! Thank you everyone. Your comments truly mean a lot to me and thank you so much for your support too! 🙂 I’ll close comments for now.